There is a number of critical factors that must form part of the process when using or specifying weberend RB. The following points must be considered on any project where weberend RB has been specified as a finish. The recommended method of finishing weberend RBF is with a soft bristle brush, tamping directly after application. Floating the surface with a sponge, trowel or float to a smooth tight finish will have an effect on colour consistency as the product cures and is therefore not recommended. The manual random process of floating the surface will induce patchiness in the final shade (particularly on large panels), and will draw the fine (cement) to the surface of the mix. The more the surface is smoothed the richer and stronger the render face becomes. Surface tension is greater and the render face is harder and more prone to surface crazing. The recommended guidance for weberend RBF is when the weberend RBB has taken up, apply 2-3mm of weberend RBF and immediately lightly texture the surface with a soft bristle brush. Light reflectance values (LRVs) for our complete standard range of weberend RBF colours have been measured and we can confirm that all are within acceptable limits and suitable to be used with Weber EWI systems. 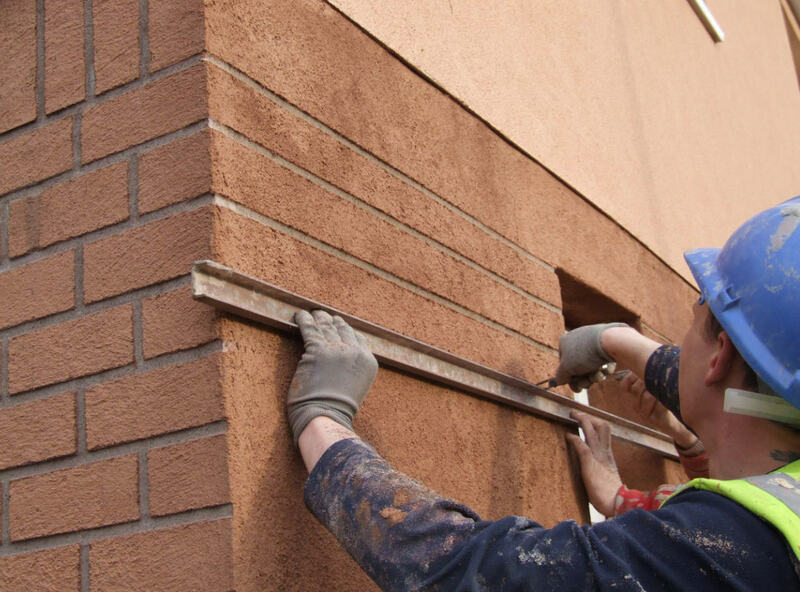 Any special order colours will go through the same check and will be signed off as to their suitability for Weber EWI systems before the product is manufactured or any samples produced. Customers must be made aware of this check at the time of enquiry. In order to minimise the risk of cracking it is important to follow best practice for mineral renders when considering panel sizes and aspect ratios. In all systems any structural movement joints must be expressed through the complete system build-up and panel control joints incorporated as required to meet the guidance given above. Areas that may be considered to be of high stress or where the material butts up to window or door frames and sills should be released by forming a gap 5mm at the juncture of the abutment that then is filled with an elastomeric sealant.